The Lennon Brothers have soaring harmonies, swingin’ sounds, and side-splitting fun! 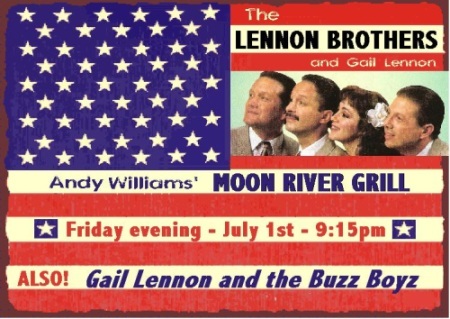 The talented Lennon Brothers – Dan, Joe, and Bill – and Bill’s wife, lead vocalist and arranger Gail Lennon, deliver the smooth rhythms and cool tunes of live swing music of the 1940’s and 50’s, backed up by the sizzlin’ Lennon Brothers Band. The Lennon Brothers Morning Show gracefully presents America’s cherished musical sounds. “We love bringing ‘swing’ into the lives of today’s generation as well as to the generation that fell in love listening to these songs,” says Gail Lennon. One night only at Moon River Grill July 1st at 9:15pm.